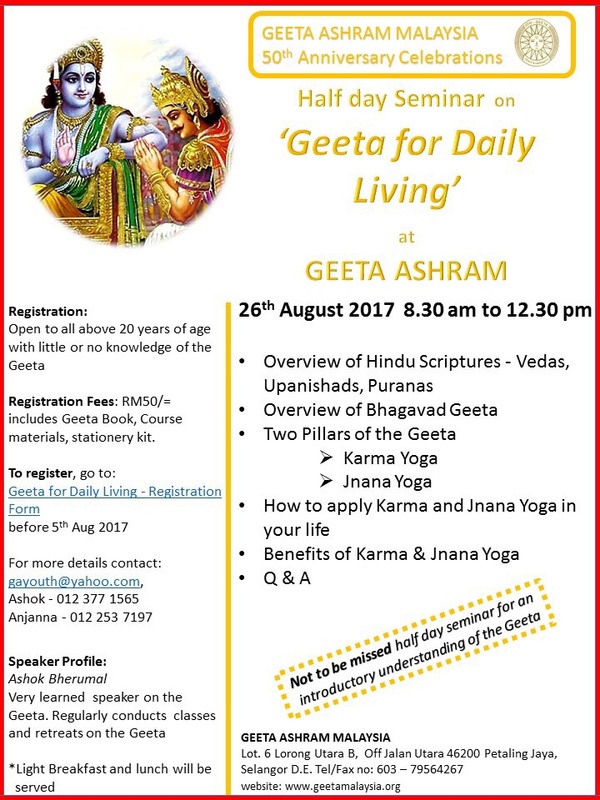 Geeta Ashram Malaysia will be organising a half day seminar on ‘Geeta for Daily Living’ conducted by Bro. Ashok. This seminar is meant to target those who have little or no knowledge on the Bhagavad Geeta and are thirsting for knowledge 😊. The seminar will be on 26/08/2017 from 8.30am – 12.30pm at Geeta Ashram Malaysia. This will include a Geeta Book, course materials, stationary kit, breakfast and light lunch. Once registered and the payment confirmed, participants will receive a confirmatory email, including a registration number for your records. There are limited places for this event, so do sign up quickly! Lesson 20 has now been uploaded! We understand that there were some difficulties in accessing Lesson 19 – we have tried to correct the issue and we hope that it is accessible now. We truly apologize for the inconvenience caused. Do listen to the lessons here. Our sincere apologies for the delay in uploading the Geeta Lessons by Bro. Ashok. Lessons 10 – 13 are all up now 🙂 Click here for the lessons! If there is any difficulty in loading them, please do not hesitate to contact the youth at gayouth@yahoo.com and we will try to assist you as soon as possible. We do apologize for the delay in putting this up! For audio clips from the previous lessons, click here.